“I’ve been working on a way we can show our appreciation for those who help to protect us and enforce the law,” said Lewis County Judge Executive Todd Ruckel. Ruckel said the ceremony will be the beginning of a monthlong show of appreciation for those involved in law enforcement locally. The ceremony will begin at 11:00 a.m. Wednesday on the front steps of the Lewis County Courthouse. Ruckel said that during the ceremony he will officially proclaim August as Law Enforcement Officer Appreciation Month in Lewis County. “With all that is going on across the country and around the world, I feel we should come together to let our officers know that we appreciate them and support them,” Ruckel said. “They risk their lives each time they put on that uniform and that badge,” he said. “The members of our law enforcement agencies have pledged to safeguard the rights and freedoms of our citizens, as well as protect them,” he said. “This is a small expression of our appreciation of the invaluable work these officers do every day,” Ruckel said. Ruckel said representatives of the Lewis County Sheriff’s Department, Vanceburg Police Department, and Kentucky State Police will be on hand for the ceremony. 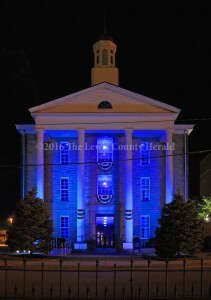 Ruckel said he has been working to install special lighting at the entrance of the courthouse that will be illuminated each night throughout August as a visual tribute to officers. “It will serve as a subtle reminder that our officers are working to enforce the law and answer calls for help at all times,” Ruckel said of the lighting. Ruckel said representatives of each department will be asked to say a few words and other officials will be present as a show of support for those who are sworn to serve and to protect. Ruckel invites everyone to the ceremony and said the program will be moved inside if the weather isn’t cooperative.